This book distills the essential elements of world politics, both the enduring characteristics as well as the revolutionary changes that may be altering the very fabric of the centuries-old state system. Author J. Martin Rochester explores all the important topics that one would expect to find in an IR text (war, diplomacy, foreign policy, international law and organization, the international economy, and more) but injects fresh perspectives on how globalization and other contemporary trends are affecting these issues. In addition, the author does so through a highly engaging, lively writing style that will appeal to todays students. 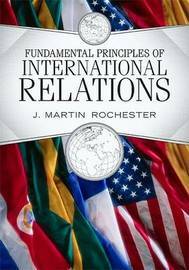 Fundamental Principles of International Relations is a tightly woven treatment of international politics past and present, drawing on the latest academic scholarship while avoiding excessive jargon and utilizing pedagogical aids while avoiding clutter. Rochester ultimately challenges the reader to think critically about the future of a post-Cold War and post-9/11 world that is arguably more complex, if not more dangerous, than some previous eras, with the potential for promise as well as peril. J. Martin Rochester is Curators' Distinguished Teaching Professor of Political Science at the University of Missouri-St. Louis and the author of several books and articles on international politics, organization, and law, including US Foreign Policy in the twenty-first Century (Westview Press).